For those of you familiar with 20th century modern art, the name of Italian artist Giorgio Morandi (1890-1964) will definitely ring a bell, though with a quiet, meditative sound... When one encounters his modestly-sized still lives, the inevitable question is why one continues to stare at the small clusters of ordinary objects painted in Morandi's signature muted colors. I remember seeing a stellar exhibition of his works a few years ago at the Metropolitan Museum, as well as greatly enjoying a visit to his museum in Bologna, where the artist lived all his life. Here in LA until October 31st, we can catch a rare exhibition of his works -- and not at a museum, but at Kohn Gallery, which managed the near impossible task of presenting Morandi's paintings alongside the equally small, and equally meditative minimalistic paintings by American artist, Robert Ryman (b. 1930). An absolute must-see show. And here is another adventure you don't want to miss -- a trip to Greece. Especially considering that your tour guides will be English antiquarian Edward Dodwell, who produced close to 1,000 watercolors and drawings of Ancient Greek countryside. At the very beginning of the 19th century, Edward Dodwell (1777 - 1832), along with Italian artist Simone Pomardi, toured Greece for 14 months documenting the country landscapes and its famous ancient architecture. 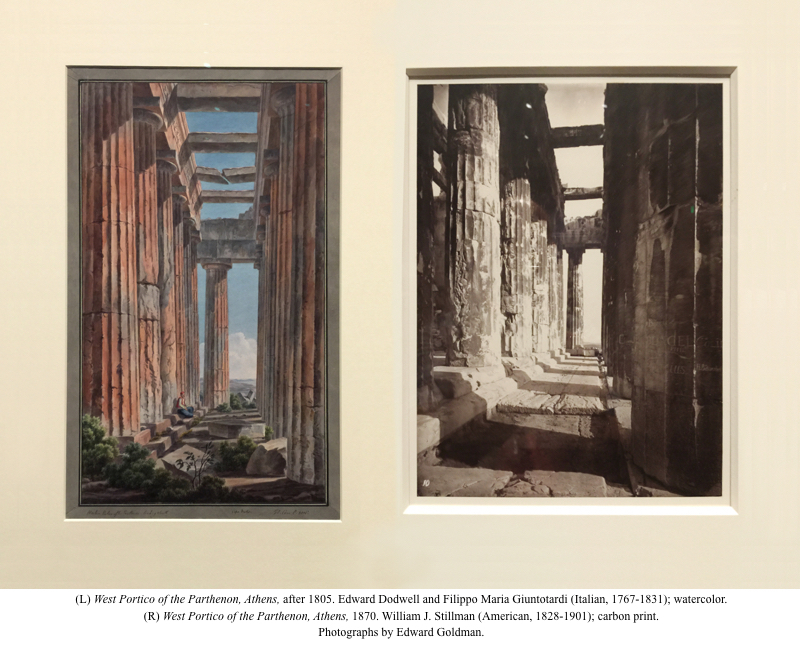 Now, at the Getty Villa, you can enjoy seeing several dozen of these watercolors borrowed from the Packard Humanities Institute. What make these works so interesting for us are not only their precision and technical virtuosity, but also the fact that the artists captured the moment when Acropolis -- with all its famous ancient ruins -- was still crowded with much later and far more ordinary buildings. At the beginning of the 19th century, Greece was still under the rule of the Ottoman Empire. 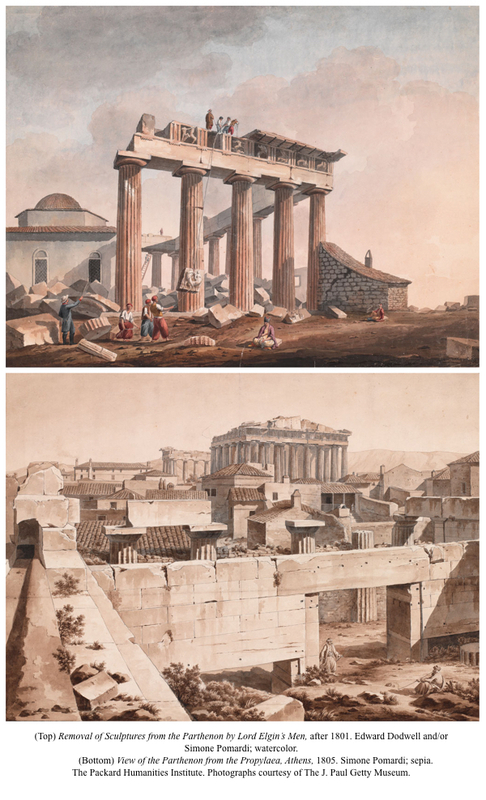 Only a few decades later, after winning its independence, the Greeks were able to demolish the cluster of these late buildings crowding the magical architecture of the Parthenon and the Erechtheion. 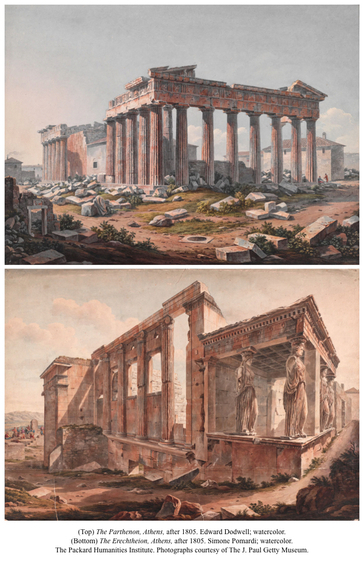 In one of the watercolors, we see the very moment when the marble sculptures were being cut from the Parthenon. Lord Elgin legally acquired them from Turkish authorities, and later sold them to the British Museum. In an ongoing moral dispute with Great Britain, the Greeks continue to demand the return of these national treasures. 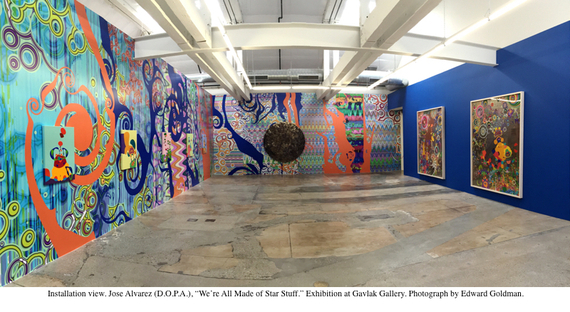 And for those of you curious to have a taste of the audacity in contemporary Cuban art, there is an interesting exhibition at Arena 1 Gallery in the Santa Monica Airport. 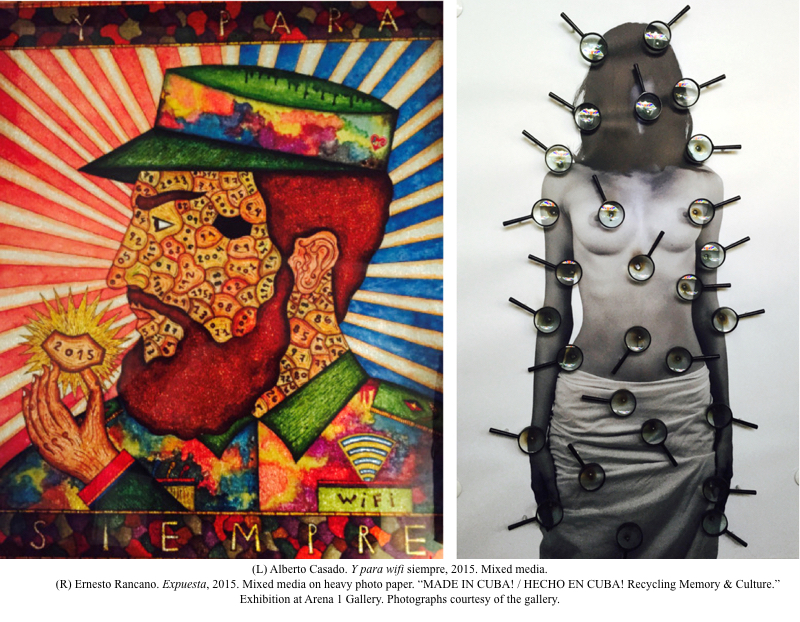 The gallery is packed with works by both well and lesser-known Cuban artists. Of course, there is the inevitable portrait of Fidel Castro, though with an unexpected touch of irony. Quite different from Castro portraits captured in the 70's by famous Cuban photographer, Korda, whose portraits were shown recently at Long Beach's Museum of Latin American Art. Last week, I had the chance to see an exhibition that was operatic in scale and bursting with color. Unfortunately, this exhibition at Gavlak Gallery by Venezuela-born South Florida-based artist Jose Alvarez ended this past weekend. So, I am sorry about such belated news, but if you have a moment, head to the Art Talk website and take a look at the installation photo of Alvarez' phantasmagorical paintings.